Following our music video release for Taboo, we are now working towards recording our first live studio session. Our visit to Coach House Studios this week was well worth the trip and after a successful rehearsal, we hope to confirm a recording and subsequent live recording very soon. This really is a hidden gem. Wolf & Moon are a new musical duo consisting of Stefany June and Talk Show Host who represent something we can all relate to - the longing for adventure and travel. Their music video for Garden of Potential is nothing short of mesmerising and compelling. If you're anywhere near Berlin on Aug 18th, we recommend seeing their live set at the Artliner Cafe while this duo are still in their formative stages. 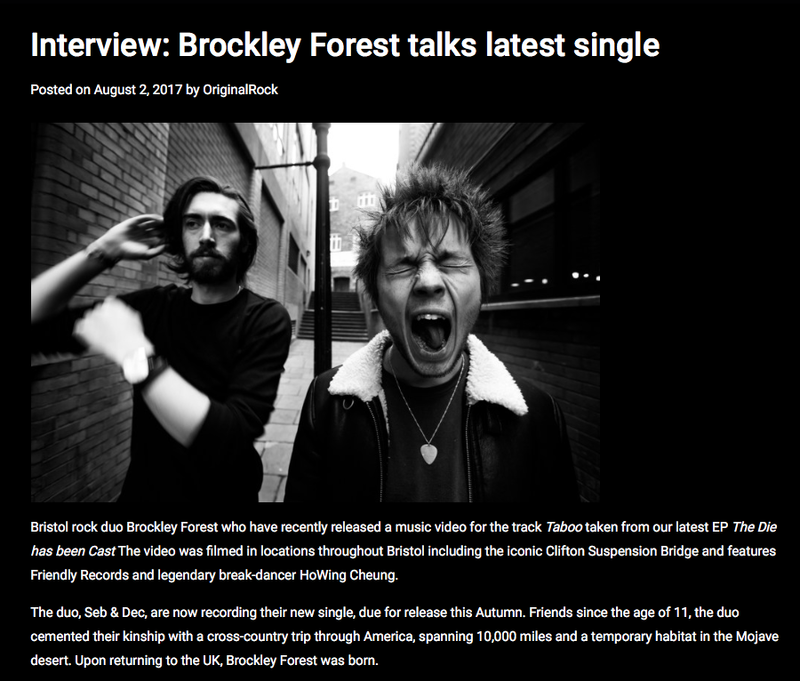 You can now read our interview with Original Rock where we discuss all things Taboo Music Video related. Our music video for Taboo taken from The Die Has Been Cast EP is now available to stream and share via Bristol Live Magazine. Can't wait for this one. DLH downhill races special in Bedminster Skate Park on Sat 12th August. We'll be playing at 4.30pm. Don't miss Cruel Prank, Then Cannons, Product Toss, Death Traps and The BBGC. Gonna be huge! Our band of the week though has to go to Nothing but Thieves who headlined on Friday night. Words do not do justice how special this band is and how captivating their set was at the festival. A more than worthy headliner who showcased some of the most spectacular vocals and musical arrangements we've heard live in a very long time. Have a listen to their track Itch and see how you feel. Pleased to announce we'll be once again sharing the stage with the wonderful Ghost of the Avalanche at The Mothers Ruin, September 2nd. Last year, we bumped into our friend and talented musician Anton Larkin who was tour managing an artist called Stevie Parker at the SWX venue in Bristol. We caught her live set just in time and were immediately drawn in by her hypnotic vocals and compelling lyrics. There was no doubt Stevie had something special and as we walked home that evening, we agreed that she was destined for great things to come. One year on, Stevie's released her debut album The Cure, played festivals including Radio 1's big weekend and has been the talk of the musical community throughout Bristol and beyond. Bristol Live Magazine recently interviewed Stevie 'before Bristol loses her for good' which gives you an insight into her modest attitude and honest reflections. A fresh musical talent that Bristol is proud of. You can listen to Stevie's latest track Prey below. We were first introduced to Guadalupe Plata through an enlightened Spanish girl who was studying in Bristol and living in one of our shared houses for a month. Pretty quickly, we became obsessed with their 2015 album released through Everlasting Records and subsequently made countless road trip playlists featuring the band. Although the group appear to tour relentlessly in their homeland, UK and beyond, we've never been able to catch their live set due to clashes with Brockley gig's... Last week, Dot to Dot was no exception when a poster caught our eye at The Louisiana with Guadalupe Plata headlining on June 10th! The same night as our Brockley gig @The Old England! But that's the way it goes in Bristol when you have so many great venues to choose from. If you're making it down the Louisiana next Saturday, let us know how it was. Guadalupe Plata, we promise we'll make it next time. Yesterday was Bristol's Dot to Dot festival, a rich and sometimes overwhelming celebration of new bands and talent. To watch even 20% of the artists playing over the city in one day (even if you're Big Jeff) is a near impossible feat. Out of all the artists we did manage to see however, Keir was a definite stand out. The first time we saw Keir was actually many years ago at The Mothers Ruin. One of us was sound engineering at that time (back when that was our main source of income) and also before Keir was even performing under that name we believe. Since then Keir has come leaps and bounds. His single 'Squeeze Me' gives you the feeling that great things are to come from this artist. His songs are powerful, gripping and expertly refined. Yesterdays performance at The Fleece was both mesmerising and audacious, without a doubt one of the highlights of the whole festival. The test footage for Taboo has proved a success and now we're getting set to record the final video next weekend. Looking forward to sharing this with you all. You can watch the trailer on our Facebook / Twitter pages in the meantime. We recall seeing King Nun's name on a few festival line up's recently such as The Great Escape, Reading and Leeds etc but it wasn't until we discovered the Youth Hymns Youtube channel (incredible Slaves live video) that we stumbled upon their music video for Tulip. We've been hoping to find a band like this for a while now. A no nonsense high octane rock outfit who beautifully capture the spirit of what being in a band is all about. The feeling of brotherhood and debauchery that coexists within this group is something to be respected. We have no doubt their live shows are a riot although it seems we may have to wait a little while before any local shows are announced following festival season. Brockley Forest will be playing @ The Old England on 10th June with The Hudson Super 6 and Twisted Ankle. Supporting Nova Twins tonight at The Louisiana. We'll be back at Green Gathering this year playing 7th August Sunday Evening. Buzzing for Farmfestival Somerset tonight.